The biography of Sir Thomas More based on Robert Bolt's play, A Man For All Seasons is a distinguished talkfest and engrossingly well-acted. The story of a principled member of the intelligentsia refusing to bend to the will of his king brings to life the high stakes political games of sixteenth century England which shaped the future of both religion and the monarchy. 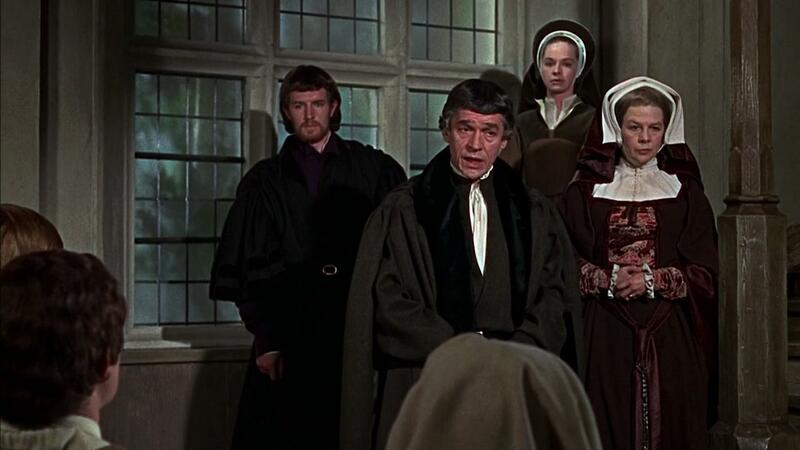 It's the early 1500s, and Cardinal Wolsey (Orson Welles) summons the independent-minded member of the Privy Council Sir Thomas More (Paul Scofield) to discuss a looming crisis. 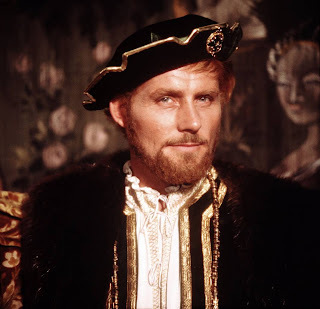 King Henry VIII (Robert Shaw) is trying to circumvent the church and invent the necessary laws allowing him to divorce his wife Catherine of Aragon and marry mistress Anne Boleyn. A principled lawyer, Sir Thomas sees no legal reason for the Pope to grant an annulment, and resists the pressure to support the King's machinations. Sir Thomas is later appointed by the King to the powerful position of Lord Chancellor. 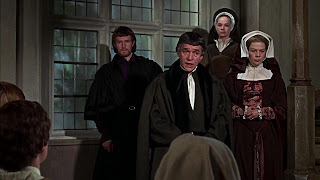 His wife Alice (Wendy Hiller), daughter Margaret (Susannah York), son-in-law William Roper (Corin Redgrave) and friend the Duke of Norfolk (Nigel Davenport) are all outspoken and provide him with varying opinions about the unfolding battle between the King and the Church. Henry desperately wants the necessary legal cover for the annulment, but Sir Thomas stands by his principles and resigns his office, maintaining silence as the King breaks away from the Catholic Church and declares himself head of the Church of England. Thomas Cromwell (Leo McKern), a senior advisor to the King, and Richard Rich (John Hurt), an ambitious but morally weak man, start to plot against More. Effectively a series of long, thoughtful conversations among a diverse group of powerful politicians, A Man For All Seasons builds authoritative momentum from complex characters. The personality contrasts allow the film to sparkle. Sir Thomas, King Henry, Cromwell and Rich all bring markedly different skills to their positions of influence. More is steeped in principle, King Henry wields his power with flamboyant madness, Cromwell is the conniving back-room operator, and Rich is the weaselly weakling, seeking undeserved position simply to satisfy naked ambition. With nothing going on except the talking, A Man For All Seasons is all about the acting, the sets, and the costumes. The cast deliver with perfection, immersing themselves in their characters and making full use of the excellent prose in Robert Bolt's screenplay. In an Academy Award winning performance, Paul Scofield reprises his stage role and gives Sir Thomas a dignified air and a calmness that comes from possessing the deepest convictions. 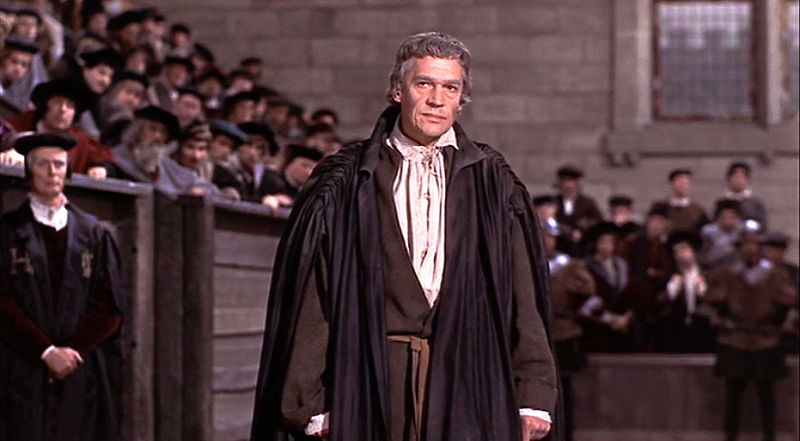 With More easily able to reconcile the laws of the land with the rules of the Church, Scofield portrays a man patient with others of lesser intellect and at peace with the destiny that comes from standing on principle and opposing the will of the King. In one his earliest film roles, John Hurt portrays Rich with searching eyes and a brain racing in all the wrong directions. Hurt captures the tentativeness of man out of his depth but riding a blind drive for power, and as More sacrifices all to stay true to his values, Rich slowly but surely sacrifices all his morals in an ugly grab for higher office. Leo McKern succeeds in portraying Cromwell as the worst example of a dark political operator, alternating between promises and threats, all delivered in couched language, to serve the master of the day and extend his own reach. 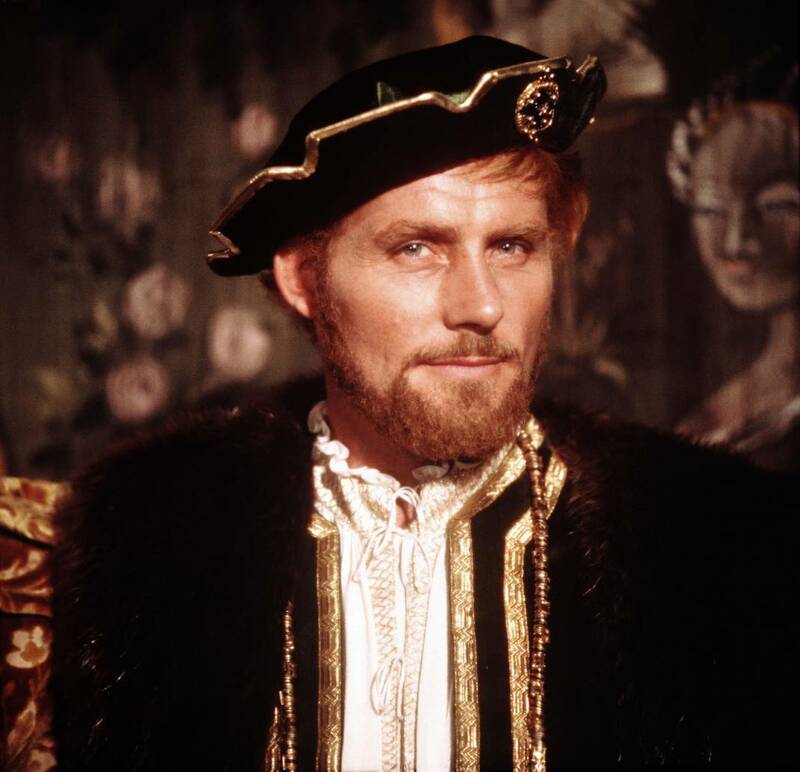 In a relatively small role, Robert Shaw has fun as King Henry VIII, all bombast, loud laughter, and pomposity fuelled by exaggerated arrogance and blind entitlement. Vanessa Redgrave appears in an end-credited cameo as a radiant Anne Boleyn. Director Fred Zinnemann, who also produced, directs at a stately pace and does his best to find some exteriors, but has to be satisfied with some repetitive river-boat taxi shots, predictable gardens and static gargoyles. He does better bringing lush interiors to life, the set designs of A Man For All Seasons recreating the grandeur of life in the top echelons of English society, as well as the dark offices and holding cells where the real decisions are made and implemented. Resisting the will of the King is ultimately not about right or wrong. Rather, Sir Thomas More demonstrated a pure example of supreme personal courage to be true to his own bedrock beliefs, no matter what the sacrifice.